Update 10/7/2017 : Version 1.21 Fixes an issue where new time frames went created. 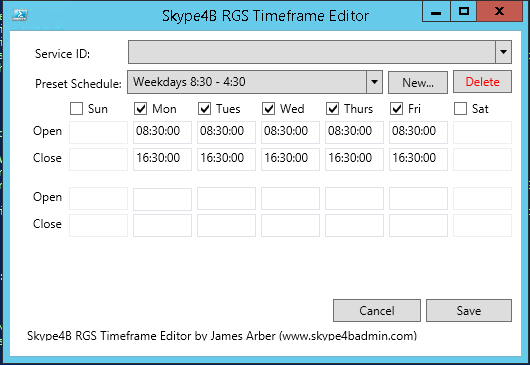 The editor allows you to create, modify and delete RGS HoursofBusiness objects ready for importing into your RGS workflows. Why do we need this script? Okay, So here’s another one of my scripts born out of a need to do some stuff over and over again. The screen will update with some example data. If you only want one timeframe per day, leave the second set of times empty. If you have an RGS Preset you need to edit frequently you can edit the defaults in the PS1 file. just wanted to clarify: when I go to the Technet Gallery, I see the latest modify date of your script was at 2/6/2017, but it still contains a .PS1 file dated 09/12/2016. Just wanted to make sure the version on Gallery is the latest. Hi Soder, good to see you still floating around 😀 Yes the Technet item was modified more recently. This was me updating the description and instructions. I havent had any bug reports yet, so no need to update the script. Sure, I am definitely floating around! Thanks for the clarification, as sometimes its difficult to correlate version number written in the sourcecode and last modify date of scripts versus what the owner publishes on Gallery or on own blog. Sorry to post again: I used your script recently (says v.1.1 inside the PS1 file), and it seems if the 2nd timeset is missing / not filled, it still shows red warnings in the PS console. I wasnt sure if it made the changes correctly though, so decided not to use the script anymore. Should your update completely eliminate these error messages, or the red errors will still be seen in the PS console but the change will anyway be correctly committed to the RGS database? Umm good question. I’ve recently switched laptops and I haven’t quite gotten Visual Studio up and running on it yet.. so give me a day or two to check. Sorry for being impatient 🙂 but did you manage to confirm that v1.1 fixed the single time period issue or it still exists? ..and the list goes on and on for all 7 days of the week..
Thats expected, when it pulls an object (or creates a base object) it cant convert a string as it doesn’t exist.